Recently, the library’s first floor window exhibit has featured artifacts from the Kensington Riots Project. The project represents a unique effort to re-examine the story of an important but underrepresented moment in Philadelphia’s history. To tell us more about this fascinating project, the Library News Blog welcomes guest writer Maria Möller. Be sure to check out the exhibit, which will be on display in the Library through Thursday, Nov. 8. For more information, including photos of the various project installations, you can peruse the Kensington Riots Project blog. 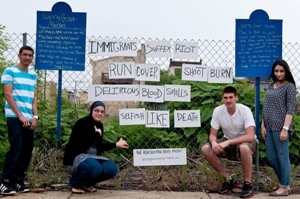 The Kensington Riots Project is a collaboration among Arab American youth, artist Jebney Lewis and me, creating site-based art that explores our country’s challenging history of immigration through the lens of the anti-Irish-Catholic Kensington Riots of 1844. 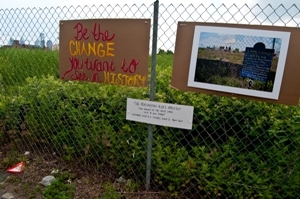 Over the course of six Saturdays this past spring, our team used photography, poetry, and installation to reclaim the sites where the riots occurred. The blocks surrounding the intersection of American Street and Master Street in the Kensington neighborhood of Philadelphia reveal no physical traces of their past. No buildings from that time survived the Riots or the neighborhood’s subsequent industrialization and deindustrialization, and no plaques mark the sites. By re-envisioning the past and overlaying personal experiences onto the blank canvas of this landscape, the project asked both participants and the public to interrogate our assumptions about who we are and where we come from. 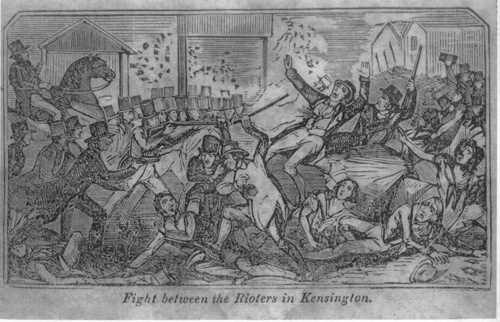 The Kensington Riots occurred during a time of economic uncertainty, increased immigration, religious fervor, and fears of foreign encroachment. Native-born Americans targeted recent Irish Catholic immigrants as the enemies of America, leading to three days of violence. The “nativists” destroyed blocks of houses and businesses, over twenty people were killed, and Saint Michael’s Church—the first Irish immigrant parish in Philadelphia—was burned to the ground. Saint Augustine’s Church in Old City was also destroyed, and its valuable library was burned. The college that would become Villanova University, which had just begun classes the previous year, in 1843, had to close its doors for over a year due to the Riots’ impact on the Augustinian community. The destruction of this historic and revered church propelled the City of Philadelphia to crack down on the rioters. By the evening of May 8, order had been restored. On May 9, thousands of Philadelphia attended a peace rally. Today, the identities have changed, but many of the same conflicts remain.